II-VI is also the only source for a complete line of 5 - 6µm scanning optics. From galvo mirrors for beam steering to beam expanders for beam shaping, II-VI can provide a complete set of optics for your scanning system. II-VI can also provide single element and multi-element scanning lenses for all laser machining applications. For high performance systems, like via-hole drilling applications, II-VI can custom design and manufacture lenses to meet all of the most demanding requirements. 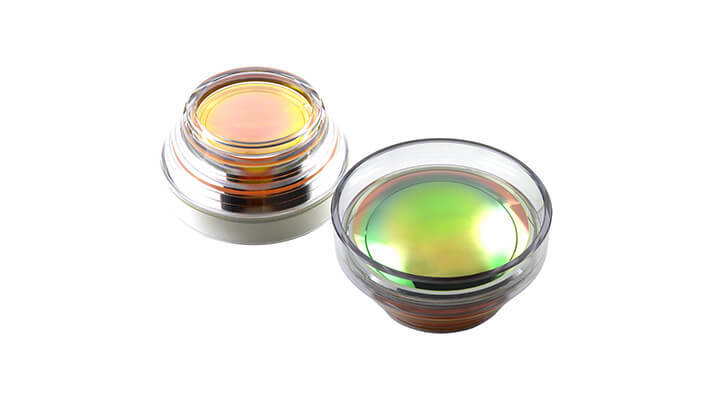 II-VI has developed a full suite of coatings covering Anti-Reflective coatings, Reflective coatings, BandSelective resonator coatings, Beam Splitter, and Polarization coatings. These coatings were developed with the multiple lasing lines of the CO laser in mind. These coatings are broadband in the 5µm - 6µm range to cover the CO spectrum.